Writers, artistes and activists from different parts of the country came together in Dharwad for a protest march on August 30th to mark the passing of a year since the assassination of Dr M.M. Kalburgi. The protesters set a deadline of one month for the Karnataka government to arrest the persons involved in the assassination. 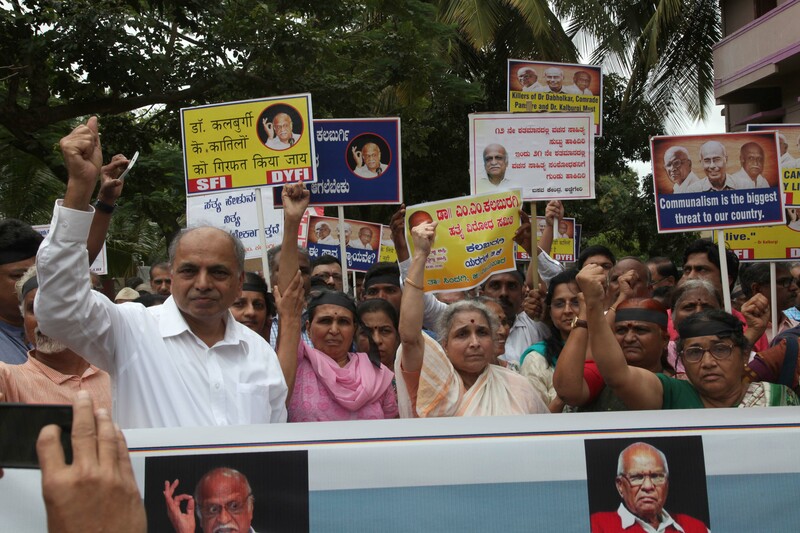 Expressing solidarity with the family members of slain thinkers and activists Kalburgi, Govind Pansare and Narendra Dabholkar, secularists attending the public meeting condemned the Karnataka government’s slow investigation of the case. They also threatened to gherao the upcoming assembly session to be held in Belagavi in November. In his keynote address, linguistic scholar Ganesh Devy said the event was an answer to the fascist forces taking over the nation that are intolerant to different kinds of thought. Kannada critic Narahalli Balasubrahmanyam termed the convention a historic event. 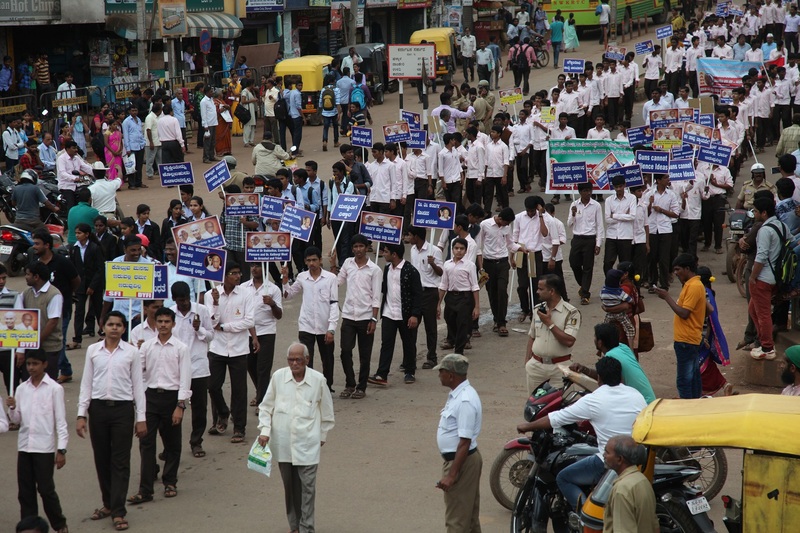 in which over 5,000 students and commoners of Karnataka were present. Filmmaker Anjum Rajabali said the three martyrs continued to remind us of the significance of liberalism and freedom of expression, which were under threat in the current atmosphere. "It is the right time for us to become capable of respecting freedom of expression. We have also gathered here to protect our secularism. Let the rule of law prevail in the nation," he added. Prof Rajendra Chenni, a writer from Karnataka, said freedom of expression stood threatened in many countries of the world. "Fascist forces are grabbing the rights of farmers, labourers, and selling them to corporate interests. If we don't raise our voices against this trend, we will all become slaves of one thought and religion." He asserted that Kalburgi had revived truth by capturing facts in his scholarly output of about 4,000 pages in Kannada. "His researches always concentrated on truth and life. However, the government is insulting the scholar by delaying the investigation into his death. It does not have the moral courage to show its face to the martyrs' family members. Having waited one full year, we have lost faith in the government, and are dispirited by its readymade assurances," he lamented. on his first death anniversary on Tuesday in Dharwad. Prof Chandrashekhar Patil, who was a classmate and colleague of Kalburgi's, said Kalburgi, Pansare and Dabholkar were synonymous with a revolution. "Today’s convention is not only about offering condolences, it is a platform of pain, protest. The government should crack the mystery of the murder at the earliest. There is an opinion that communal forces have been a hurdle in expediting the investigation. Chief Minister Siddaramaiah should clarify… whether his government has also bowed before fascism," he demanded. Megha Pansare, daughter-in-law of Govind Pansare, demanded that the conspirators be brought before the people to maintain their faith in the administration. "Though governments have mechanisms like the CBI and CID, they are not doing effective work in cracking these assassination cases. At the other end, different thoughts are being suppressed and silenced using weapons." Mukta Dabholkar, daughter of rationalist Narendra Dabholkar, demanded to know how Kalburgi was killed even though his residence was located in a posh area of Dharwad, right in the heart of the town. Calling him an asset to the nation, she blamed the Congress- and BJP-led governments for their failure to protect scholars and intellectuals. Goan writer Damodar Manjo echoed her words, adding, however, that he was glad to see fellow Indians fighting against fascists now targeting dalits in Gujarat and other states. 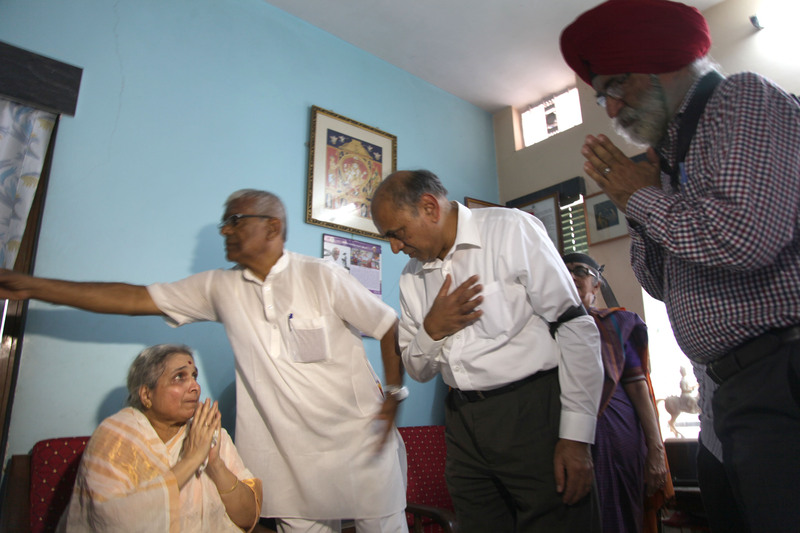 Kalburgi's son Srivijaya said the wounds created after his father's assassination were still fresh. He recounted, "My father used to tell us to work for society and humanity. He always fought for social equality and a healthy society. I feel that it is those who murdered him who are the anti-nationals. They killed an aged person; they are not brave, but cowardly." He concluded that even after their death, Kalburgi, Pansare and Dabholkar were still alive. Dr Kalburgi, Pansare, Dabholkar Hatyavirodhi Horat Samiti in Dharwad, on Tuesday. Aravind Malagatti, a dalit writer from Karnataka, questioned the state and central governments over the rise of moral policing and vigilante justice. He reminded the gathering of the need for a Gandhi nation, even as fascists attempt to convert India into a Godse nation. Claiming that progressive thinkers were the real patriots, Malagatti suggested that in order to discover the reality of India, the prime minister "should come face to face in a discussion with commoners rather than addressing citizens through his Mann Ki Baat show on the radio." Several speakers questioned the social developments that have led to increasing attacks on secular and rational thought. Veteran Kannada writer Guruling Kapse noted that Basavanna, a social reformer of the 12th century, and Kalburgi were both from the Vijayapura district of Karnataka. "As a scholar, Kalburgi spread Basavanna’s teachings and revived them with his truth based research," he remarked. Noted scholar of Bhagat Singh's writings Prof Chaman Lal likened Kalburgi’s murder to the murder of the Vachanas ordered by the Sharanas of the 12th century, and placed his work in the tradition of thinkers like Guru Nanak, Kabir and Akkamahadevi. Marathi writer Anand Karandikar observed that "assassinations of anti-brahminical and anti-caste movement leaders have been common in India." In the same vein, activist K. Neela from the Janwadi Mahila Sangathan, related the struggle against authoritarianism to the growing dalit movement in Gujarat as well as farmers' rights movements in other parts of the country. Others in attendance included Noor Sridhar, Marathi writer Kumar Ketkar, veteran playwright Siddhaling Pattanseti, senior journalists Siddharth Vardarajan and Antara Dev Sen, economist Jaya Mehta, CPI leader Siddanagouda Patil, and TUCI state president R. Manasayya. Attendees voiced the urgent need to recast public discourse so as to protect India's multi-cultural, multi-linguistic heritage, and called attention to the repressive diktats around food, religion and thought issued during the Modi regime which have led to several incidents of mob violence. Several speakers attested that the struggle would continue until an end was put to atrocities committed on the basis of cultural and ideological differences. Also see this article in the Caravan magazine about the murders, and Seema Chishti's piece in the Indian Express.